UK rail electrification costs could be cut by 33% to 50% with the help of a 10-year rolling programme where engineers move on from scheme to scheme, maintaining expertise and using innovative technology. Strengthening the argument of our February update, this is pretty much what the Electric Railway Charter has argued all along. Now it is backed up with data and evidence of good practice in new a report from the Rail Industry Association (RIA). 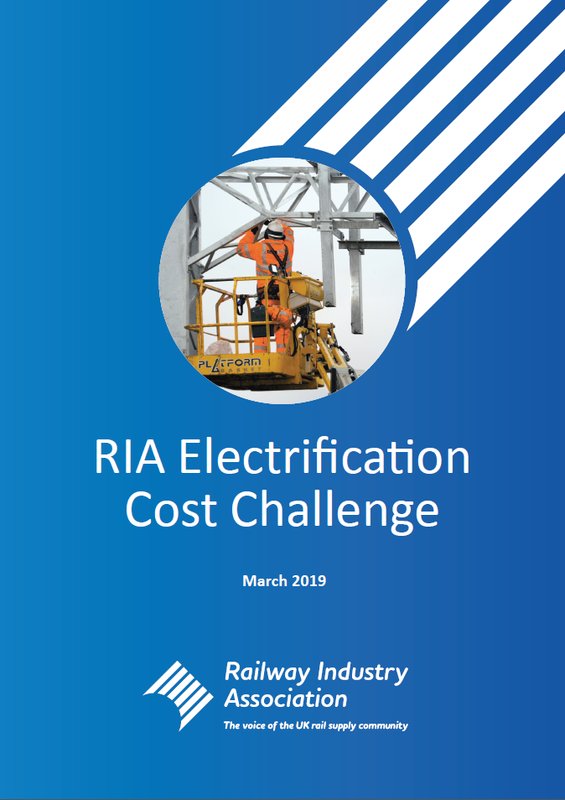 The RIA’s Electrification Cost Challenge report cites examples from the UK and internationally. It shows how high costs seen on recent projects, including the Great Western Electrification Programme, can be avoided in the future. It suggests that significant increases in cost on some past projects like Great Western should be a one-off, caused by an unrealistic programme of work, unpreparedness in using novel technologies resulting in poor productivity and a ‘feast and famine’ electrification policy. In other words failure was due to loss of a skill after a long period when little electrification had been done. Examples of good practice come not just from overseas. Right on our doorstep the Scottish Government has pursued a successful rolling programme of electrification. The Airdrie-Bathgate-Edinburgh scheme was on time and on budget. Some schemes went over budget but overall the trend has been to reduce costs. With a logical network approach the central Scotland programme covers both main lines and branches – from the Edinburgh-Glasgow inter-city routes, to the short Stirling-Alloa branch. There are four railway routes between Scotland’s first and second cities, when they have finished wiring the Shotts line in a few weeks’ time, all four will be electrified. Meanwhile, Northern England under the rule of the Department for Transport struggles to approve full electrification of a single route between Manchester and Leeds. But with the RIA report the challenge now is to Network Rail to electrify the complete Manchester-Huddersfield-Leeds-York route within the DfT’s budget (£2.9bn) for a gapped scheme. Taking up the RIA call for a rolling programme, next step could be a Northern rolling programme as the all-party task force recommended in 2015. The task force’s top recommendation was the full Calder Valley Line, and as Charter campaigners we say our line makes complete sense as a network scheme complementing the Huddersfield Line as an equally intensively used route. The promise of cost reductions through a rolling programme is realistic. It strengthens the case for full electrification rather than gapped schemes that would rely on polluting, climate-damaging energy sources to bridge the gaps. Coupled with the skills and cost-advantages of a rolling programme, better technology will play a part. Already we can point to UK examples. In Cardiff a difficult bridge over the Great Western Main Line could have cost the electrification project between £10M and £50M in terms of options for rebuilding or track lowering to provide clearance for 25kV wires. Instead the railway engineers used surge arrestors in the electrical supply and an insulated coating on the bridge at a cost of less than £1M. The RIA cost challenge findings follow a report by the Institute of Mechanical Engineers The Future for Hydrogen Trains in the UK. The IMechE makes three front-page recommendations. Recommendations 2 and 3 support development of hydrogen power and its deployment initially in areas where there is a significant hydrogen production industry. But recommendation number 1 is that the UK government rethinks cancellation of electrification schemes, and “moves forward with a more innovative, and long-term approach electrification rolling programme, to create skills and careers, develop supply chains, and work with existing rail networks to manage projects”. Themes in his blog are explored further by David Shirres in an article Relearning Electrification in the March 2019 issue of Rail Engineer magazine. Update Feb’19: No excuses – give us electric trains! Sign Calderdale’s petition! The neon heart image is from Calderdale Council’s #electricvalley campaign calling for electrification of the Calder Valley Line. The council has launched a petition on Change.org. For more information and a link to support and sign use the hashtag #electricvalley or go straight to Change.org here. environment, action against climate change, and good growth. A clean, energy efficient high-performance electric railway will encourage modal shift from congested roads in a “green sparks effect”. Wiring costs are predicted to fall significantly, strengthening the case for full rather than gapped electrification of strategic routes, one of which the Calder Valley Line (Leeds to Manchester/Preston via Bradford/Brighouse) was top recommendation of the 2015 task force. the aim must be a zero-carbon railway with fully electric trains. Modern electric trains are able to recover energy through electric braking making them even more “eco-friendly”. We call for a rolling programme of electrification across the North, based on the Northern Electrification Task Force (NETF) recommendations in the March 2015 Northern Sparks report. Based on business, economic and environmental criteria NETF ranked the Calder Valley Line (Leeds-Bradford/Brighouse-Hebden Bridge-Manchester/Preston) as top scheme heading list of 12 lines in initial 5-year programme). A rolling programme with effective project management will reduce costs and disruption as skills are regained and improved. New technology, innovative methods can help solve problems. Overhead line equipment (OLE) does not have to be over-engineered. It is true that recent electrification schemes suffered cost and time over-runs. Mistakes were made because a period of little or no new electrification had allowed established concentrations of engineering skill to dissipate. The Great Western electrification cost about £3.5M per single-track kilometre (s-t km). In comparison recent North West England and Scottish schemes were about £1.25M to £2.0M/s-t km, and the European norm is about €1M (£800,000)/s-t km. Modern Railways magazine columnist Roger Ford discusses these figures from the McNaughton review of electrification cost (commissioned last year by the DfT). There is strong optimism that electrification costs can be brought down through a rolling programme supported by a national centre of engineering excellence giving a specific cost of significantly under £1M per track kilometre. (FORD, Roger, in MODERN RAILWAYS, March 2019: INFORMED SOURCES e-Preview: http://live.ezezine.com/ezine/archives/759/759-2019.02.18.03.45.archive.txt). Good planning with teams moving on from project to project will also reduce disruption during the work to put up the wires. Sustainability: zero-emissions, zero-carbon railway – the green “sparks effect”! The Autumn 2018 special report by the Intergovernmental Panel on Climate Change said global society can tackle climate change, but needs to take significant action in the next 10 years. Earlier this year a Swedish teenager Greta Thunberg put powerful grown-ups to shame with her 32-hour train trip to Davos to address the great and good of global economics. Let us all be inspired. Environmentalism must take hold and those of us in the most developed countries must surely take the lead. Rail is already a relatively low-pollution, low-carbon transport mode but must keep up as road transport decarbonises. We want to attract people onto train travel and off congested, air-damaging roads. As electricity generation decarbonises so will electric railways. Travellers will increasingly make green consumer choices. Modern trains that protect the health of people and planet are simply more attractive. This is the green “sparks effect”. And it only really works with electric trains. So the Charter rejects the idea of continuing use of diesels or other trains using carbon-derived energy to bridge gaps left by incomplete electrification of strategic routes such as the Calder Valley Line. “Diesels” include diesel bimodes that still pollute and are even less efficient, carrying the mass of both diesel engines and electric collection equipment and transformers. We do not want trains that still damage air quality in stations. Polluted stations like Manchester Victoria need to be made fume-free. And we should beware false prophets preaching excuses for not getting on with electrification. Alternatives such as hydrogen trains (carrying hydrogen fuel as compressed gas which is used to generate electricity through fuel cells or through combustion and turbine) may have some application on rail. But the latest thinking is that this is likely to be limited to relatively lightly used branch lines. In a recent report The Future for Hydrogen Trains in the UK, the Institute of Mechanical Engineers (IMechE) warns against hydrogen being seen as a substitute for electrification. Whilst supporting hydrogen development, the IMechE’s first recommendation reads: “That the UK Government rethinks the cancellation of electrification programmes and moves forward with a more innovative, and long-term approach, electrification rolling programme, that can create skills and careers, develop supply chains, and work with existing rail networks to manage projects.”. We should beware also claims of “zero emissions” omitting “at point of use”. Hydrogen as currently produced is effectively little lower carbon than diesel. And storing energy from electricity in hydrogen (by electrolysing water) and then returning the energy to electricity through fuels has a lower “round-trip efficiency” than storage in batteries. More information and references in our expanded Arguments for Electrification paper (February 2019). PDF version of this blog here . Author jstephenwaringPosted on 20th February 2019 23rd February 2019 1 Comment on Update Feb’19: No excuses – give us electric trains! So… there’s no carbon in hydrogen… so hydrogen trains have got to be zero-carbon, right? Safety. The high flammability of hydrogen rarely gets a mention. Is this really not a worry? Should we not be asking questions about trains with large tanks filled with compressed, easily ignited gas? What if there were a leak in a tunnel or some of our more enclosed stations? Hydrogen has a good safety record in industrial use but surely we are right to ask for reassurance about the use of the “Hindenburg gas” to fuel trains? Storage on trains and train performance. The world’s first hydrogen train, the Alstom Coradia iLint, in service in Germany, has hydrogen tanks on the roof. Alstom’s proposed “Breeze” prototype for the UK takes a former electric train, and reduces it from 4 carriages to 3 with a third of one carriage used for the large fuel tanks that don’t sit so easily on the roof within the UK loading gauge. Like the iLint, the trains will have batteries enabling energy recovery from braking. Maximum speed 140km/hr (87mph) will be less than the 100mph capability of the 321 as an electric – but yes, more than adequate for minor branches. Energy efficiency of H2 storage compared with batteries. It seems the Oxenholme-Windermere “Lakes Line” will get battery-powered trains in the early 2020s. Battery storage is notably more energy-efficient than using electricity to produce hydrogen, storing it in tanks, and then getting the electricity back using fuel cells. Batteries are heavy, but battery technology will move ahead rapidly driven by demand from renewables development and (ironically) electrified road vehicles. Battery bi-modes on the Lakes Line could charge during layovers at Oxenholme on the West Coast Main Line and in service on trips to/from Manchester. This would reduce the required battery capacity. Of course, Lakes Line electrification might have been completed by now, had it not been cancelled. We still do not know quite what the scope of the Trans Pennine route upgrade (TRU) on the line through Huddersfield is to be. The Government has yet to announce its final decision on options. But work is supposed to start in a few months time, so hopefully we are going to be told soon. The North of England needs a full job doing with electrification right through from York to Manchester, linking the East Coast Main Line with the already wired Manchester and Liverpool railway. The upgrade should also include extra tracks – reinstating 4-track sections that were removed decades ago – to increase capacity. We hope this will include 4-tracking between Huddersfield and Mirfield/Ravensthorpe. Those extra tracks will be vital if the Calder Valley service via Brighouse towards both Leeds and Huddersfield is to be improved. The physical capacity to be gained by additional tracks can not be replicated in “virtual” form by digital signalling. What’s missing from this scene? Northern diesel train. City skyline as backdrop. What’s the cantilever structure that doesn’t seem to be doing anything? Evidence of unfinished electrification scheme. This is a bright winter’s day at Manchester Victoria, pleasantly cold and fresh outside but in more enclosed parts of this station the atmosphere is foul with diesel emissions. Recent media reports suggest Government may be about to limit the scope of TRU. It is said that maybe only about two thirds of the route from York/Leeds through Huddersfield may be electrified. The section from Huddersfield to Stalybridge could be left unwired. But that section, crossing the Pennines with gradients requiring high performance to maintain good timings, could be the very section that would benefit most from modern electric traction. Bi-mode electro-diesel trains carrying extra weight of engines are unlikely ever to match the acceleration and hill-climbing of pure electrics, and they will continue to emit pollutants that damage local air quality and add to global warming. We write as the COP24 climate change conference deliberates in Poland. The Electric Railway Charter calls for implementation of the rolling programme of rail electrification that was recommended nearly 4 years ago by the Northern Electrification Task Force. Top-ranked scheme was the Calder Valley Line and the Charter says this line would follow on naturally after the Huddersfield Line TRU. Charter campaigners have written to Chris Grayling, Secretary of State for transport. We politely ask him to approve the TRU with full electrification and capacity benefits, and commit to a rolling programme across the North. Read our letter HERE. The Charter, as we keep saying, is not dogmatic about electrifying every single metre or even kilometre of route. Gaps through tunnels and other structures that are a challenge to electrify can be bridged by trains using modest amounts of electrical battery storage. This is actually being planned for the South Wales “Valleys” lines. It is more efficient in energy terms – and better economics – than wasteful diesel bi-mode trains that have to use more energy to accelerate more mass. As for alternative fuels such as hydrogen, again this is a less efficient way of storing and transferring energy than pure electric or electric plus batteries. Meanwhile new technology will make installation of the high voltage overhead line equipment easier. Engineers Mott MacDonald have come up with a new design of support for the wires, using a composite wood-based material that combines required electrical insulation and structural functions (https://www.mottmac.com/releases/mott-macdonald-and-moxon-unveil-prototype-for-innovative-integrated-overhead-line-structure). Updating our recent post, we record with thanks the decision of Calderdale Council to sign up in support of the Electric Railway Charter. Following an earlier report agreed at council cabinet, Calderdale will now campaign to make electrification of our line top priority – as it was in the “Northern Sparks” all-party task force report of three years ago. The full resolution passed at full council on 19 September copied below. Meanwhile news has come out (a deliberate leak?) on the TransPennine (Huddersfield line) Route Upgrade, which looks to be proposing (as expected) “some” electrification. You might think this would include the section through the hills between Huddersfield and Stalybridge where the superior performance of electric traction would help to cut journey times. You might also expect the easy section from Leeds to York to be included, filling a short gap in existing wiring between Leeds Neville Hill depot and the East Coast Main Line at Colton Junction. But no, all that seemed to be mentioned in the news that came out was Leeds-Huddersfield, and Stalybridge-Manchester (which latter should actually have been finished by now as part if the North West scheme). It sounds like there will be extra capacity, involving reinstatement of four tracks along the Huddersfield-Mirfield corridor. Campaigning rail user groups in the Calder Valley hope this will enable more services through Elland and Brighouse. Sadly the news seemed to emphasise the disruption that would be caused whilst the work is carried out with long blockades of sections of the Manchester-Huddersfield-Leeds route. We hope this is not part of a softening-up process to prepare us for a more negative announcement. Smart ways of working should be adopted with work being done at night and at less busy times. Remember that in the 1980s British Rail electrified the East Coast Main Line from Hitchin to Edinburgh, 360 miles, with considerably less fuss than is currently being made about a fraction of that distance in the Pennines. The Electric Railway Charter calls for a rolling programme of electrification across the north, starting with the Calder Valley as a natural follow-on to the Huddersfield Line. We believe a smarter approach can minimise the cost, time taken and disruption during construction. The message should be that we need a well-planned programme to develop a modern, environmentally sustainably railway that offers high capacity and high performance with traction that aims for zero-carbon, zero-emissions. · Cabinet has resolved that Calderdale shall be a signatory of the the “Electric Railway Charter” – a campaign of rail users on the Calder Valley line calling for the line to be electrified. better train services on the Calder Valley line would vastly improve the lives of the 2.7 million who commute between Leeds, Manchester and Bradford. A more reliable rail system would support local economies and take pressure off the road network. Electric trains emit up to 35% less CO2 in stations and are across their routes, less polluting that older diesel units. iv. Requested that the Leader urges the MPs for Halifax and the Calder Valley to take all possible steps to support this campaign, including lobbying the Secretary of State for Transport for a clear commitment to an ambitious timetable for delivering the electrification of this vital route. Author jstephenwaringPosted on 7th September 2018 14th December 2018 1 Comment on Electric Railway Charter update September 2018 – Calderdale takes up campaign. Smart electrification for our line?